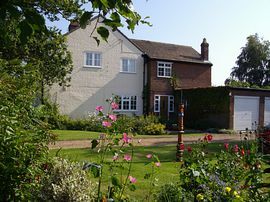 Peaceful, friendly B&B in rural location with comfortable rooms with views of large, attractive garden and surrounding fields. Complementary tea and homemade scones on arrival. 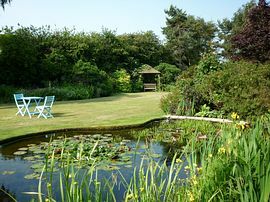 Set in farmland on the edge of the Norfolk Broads National Park and within three miles of the beautiful Norfolk coast with its fine, sandy beaches. Within easy driving distance is the historic city of Norwich with its Norman cathedral and castle, and excellent shopping. 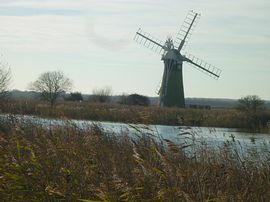 Located on the edge of the Norfolk Broads National Park with its nature reserves and unique landscape. Boats and canoes can be hired locally and are a great way to explore the Broads and waterways. The area is rich in gardens and historic houses e.g. 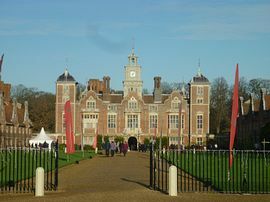 Hoveton Hall Gardens(HHA), East Ruston Vicarage Garden, Fairhaven Water Gardens, Somerleyton Hall (HHA), Blickling Hall (NT), Felbrigg Hall (NT), Sheringham Park (NT). Other attractions include steam railways, craft centres, nature reserves, wildlife park, good walking/cycling and beautiful villages. Twin room available for children. Relax in the beautiful garden. Special Diets Provision: Special diets are catered for. Will respond to client's wishes. 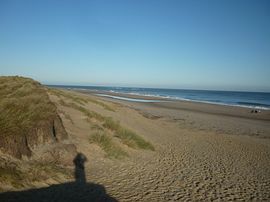 From Martham village centre follow signs to Hemsby. Mill Farm House is about half mile from village green on the right at the top of the hill. Double room £60-£65 per night, including breakfast and tea and home made scones on arrival.